The FDNY – long celebrated as New York City’s bravest – is being supported by some of the world’s greatest superheroes in honor of the Department’s 150th anniversary and New York Comic Con with an exclusive line of superhero inspired FDNY helmet designs. Featuring Spider-Man, The Hulk, Captain America, Black Widow and others, the helmets have been created for a charity auction that will raise money for the FDNY Foundation. The helmets were designed by the industry’s leading comic book artists including Marvel’s Chief Creative Officer, Joe Quesada, along with Damion Scott, Kaare Andrews, Walt Simonson and others who used their skills to render awe-inspiring illustrations of these recognizable heroes. The helmets draw inspiration from some of Marvel’s greatest heroes. Quesada, a longtime FDNY supporter and the creative force behind “Heroes” a historic tribute book featuring Marvel superheroes in the wake of the 9/11 tragedy, created a Captain America inspired helmet featuring his iconic shield. Damion Scott introduces the world famous web-slinger – Spider-Man – into a vibrant helmet design full of the character’s iconic blue and red. Other artists contributing to the program include Phil Jimenez, Phil Noto, and Joe Rivera. The majority of the helmets were auctioned off at charity event on October 10, but those helmets not auctioned off at the event will be available for auction at the ReedPOP Supply Co eBay account from October 19-23. All money raised will go to benefit the FDNY Foundation, the official non-profit organization of the New York City Fire Department. It’s been one year since the death of Archie that took place in Life With Archie #36 shook Riverdale to its very core. The residents of the most welcoming town in America, where the chocolate malts are always delicious and the neighbors are always smiling, gather together one last time for the closing ceremony of this groundbreaking series and a celebration of a Life with Archie. Archie Comics has announced they are killing Archie Andrews to conclude the Life With Archie comic series. The iconic comic book character, beloved by millions around the globe for over 70 years, will sacrifice himself heroically while saving the life of a friend in the pages of July’s Life With Archie #36, the final issue in the flash-forward series, which spotlights Archie’s adventures after high school and college. 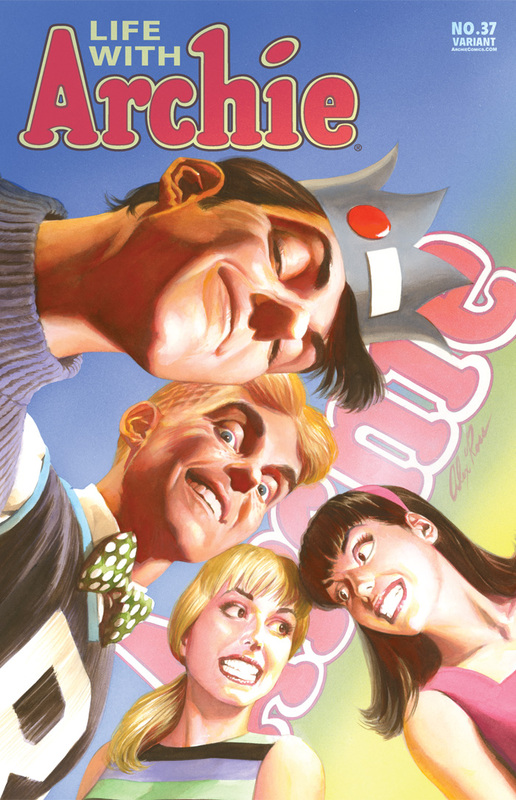 The story will be available in multiple formats, including an extra-large magazine-size Life With Archie #36, two comic-sized issues—Life With Archie #36 and #37—and a trade paperback collecting the entire story, written by regular Life With Archie writer Paul Kupperberg, with art by Pat & Tim Kennedy and Fernando Ruiz. While Life With Archie #36 shows readers Archie’s final moments, #37 leaps a year into the future, showcasing how the remaining members of the Riverdale gang—including Jughead, Betty & Veronica and Reggie—have honored the legacy of their dear friend. An impressive list of creators with be providing covers to the historic issue, including Francesco Francavilla, Fiona Staples, Ramon Perez, Walt Simonson, Jill Thompson, Mike Allred, Cliff Chiang, Adam Hughes, Tommy Lee Edwards, Jeff Schultz, Pat & Tim Kennedy, and Alex Ross. Tickets are Now On Sale for the 2013 Baltimore Comic-Con! The Baltimore Comic-Con is happy to announce that tickets are now on sale for this year’s show, taking place September 7-8, 2013 at the Baltimore Convention Center in downtown Baltimore.Tickets that are now on sale include: General Admission for Saturday and Sunday, Two-Day General Admissions, and Baltimore Comic-Con 2013 VIP Experience Packages. And much, much more to be announced as we get closer to the show! * VIP ticket holders must be in the VIP line 30 minutes before scheduled presentation times, as VIP Seating is guaranteed but not reserved and does not include special ticketed events. This year’s confirmed guests for the show include: Brian Bolland (Dial H); Mark Buckingham (Fables); Jimmy Cheung (Avengers vs. X-Men); Frank Cho (Savage Wolverine); Amanda Conner (Before Watchmen: Silk Spectre); J.M. DeMatteis (Phantom Stranger); David Finch (Justice League of America); Dave Gibbons (The Secret Service); Keith Giffen (Masters of the Universe); Adam Hughes (Before Watchmen: Dr. Manhattan); Barry Kitson (Empire); Roger Langridge (Popeye); Paul Levitz (World’s Finest); Kevin Maguire (World’s Finest); Mike Mignola (Hellboy In Hell); Jimmy Palmiotti (Batwing); George Perez (World’s Finest); David Petersen (Mouse Guard); Joe Prado (Earth 2); Ivan Reis (Aquaman); Chris Samnee (Daredevil); Louise Simonson (X-Factor); Walt Simonson (The Mighty Thor); Allison Sohn (sketch card artist); and Mark Waid (Indestructible Hulk). The Future of Marvel NOW! Is Smash. Marvel is pleased to present your first look at The Mighty Thor #1, from Eisner Award-winning writer Matt Fraction and superstar artist Olivier Coipel! Thor has ushered in a bold new era for the kingdom of Asgard. But when the Silver Surfer suddenly appears to herald the arrival of Galactus in the Odinson’s realm, can the combined might of Thor and his brethren push back the devourer of worlds? World Tree, prepare to meet the World Eater in this terrific starting point for a whole new generation of fans in The Mighty Thor #1, on sale this April! Prepare yourselves for a new Asgardian age with The Mighty Thor #1! In this all new ongoing series, from the superstar creative team of Matt Fraction and Olivier Coipel, Thor must defend his homeworld of Asgard from Galactus! When Thor and Sif retrieve an artifact from deep within the World Tree, nobody expected the Silver Surfer to show up. And where the Sentinel of the Spaceways travels, Galactus is sure to follow! It’s the World Eater vs. Asgard in the explosive opening arc that’s great for new readers! No fan can miss this monumental new series that will redefine what it means to be the Odinson! The fate of the golden city of Asgard, the wonder of the nine realms, hangs in the balance and only Thor can ensure the survival of the Asgardians! What does the World Eater seek and what terrible outcome awaits the Mighty Avenger? Discover the answers you seek as Fraction and Coipel pull out all the stops in The Mighty Thor!